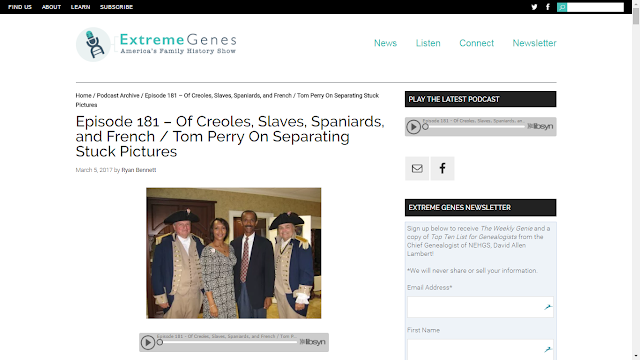 Scott Fisher's weekly Extreme Genes podcast for 5 March is now available -- see Episode 181 – Of Creoles, Slaves, Spaniards, and French / Tom Perry On Separating Stuck Pictures. Host Scott Fisher opens the show with David Allen Lambert, Chief Genealogist for the New England Historic Genealogical Society and AmericanAncestors.org. David is on the road in Louisville, Kentucky. The guys start by discussing Fisher’s bizarre find of an 1807 church record where all of his ancestors and their relatives seem to be marked with a cross! David then begins Family Histoire News with the story of a woman whose 122-year-old house is getting some very unique treatment from the government of St. Louis. Next, it’s the story of a 99-year-old Dutch woman who just checked something off her bucket list that most of us would never think of. Find out why. Then, a Santa Barbara couple planned their wedding and then learned something very unique? concerning them? about this ancient venue. Next (starts at 10:38), Fisher begins his two-part visit with Michael Henderson of Atlanta, Georgia. As an African-American Creole from New Orleans, Michael took an early interest in his family history, taking his lines back to numerous Revolutionary soldiers and branches to several Europeans countries. Wait til you hear about the two century old document concerning his ancestor he found and was able to hold. In the second segment with Michael Henderson, he talks about the experience of becoming Georgia’s first African-American member of the Sons of the American Revolution. It’s a terrific wrap up to Black History Month! Then (starts at 36:35), it’s Tom Perry from TMCPlace.com, back to talk preservation. Tom answers a question about what to do if you have pictures that are stuck together. Yes, they are salvageable! Hear what Tom has to say. I just listened to a previous podcast where Scott helped a friend interpret her DNA results. She was adopted and I think it took some time for her to learn what was really buried in the results. I would recommend it to anyone who is frustrated when it comes to understanding their DNA test.